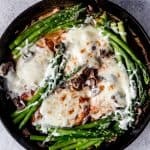 Fresh mushroom Madeira sauce, tender crisp asparagus, and melted cheese pair with tender, juicy sautéed chicken breasts to make this cheesy Chicken Madeira recipe that is one of our favorite family dinners that is special enough for weekend cooking or holidays, but easy enough for weeknights when we are craving something different from the norm. It’s touted as one of the most popular menu items at the Cheesecake Factory. Once you’ve tasted a bite it’s easy to see why! When I heard National Cheese Lover’s Day was coming up, I decided it was a holiday I most definitely needed to celebrate. Some of my food blogging friends decided to join me as well so if you keep scrolling past the recipe, you will find 15 cheesy new recipes to inspire you to eat something ooey, gooey today! What’s your favorite kind of cheese? There’s no way I could pick just one, but my top favorites are brie, mozzarella, sharp cheddar, pepperjack, and monterey jack. So whether you choose to eat something melty and gooey today like lasagna, macaroni & cheese, cheesy taco soup, or baked brie, or go with a gorgeous fruit and cheese platter, share it on IG and tag me so I can see! 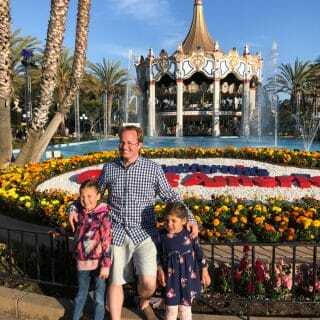 We like to eat out as a family a couple times a month and one of our favorite places to go is often Cheesecake Factory. My favorite menu item is their Mexican tortilla salad, and we all like the banana cream cheesecake and white chocolate raspberry truffle cheesecake for dessert. Paul loves the Chicken Madeira and is always torn between ordering his favorite or trying something new and I find that I’m always sneaking bites of his dish. But it’s so much less expensive to make this dish at home! You can feed your entire family for less than the cost of 1 serving at the restaurant. And honestly, it tastes even better too. 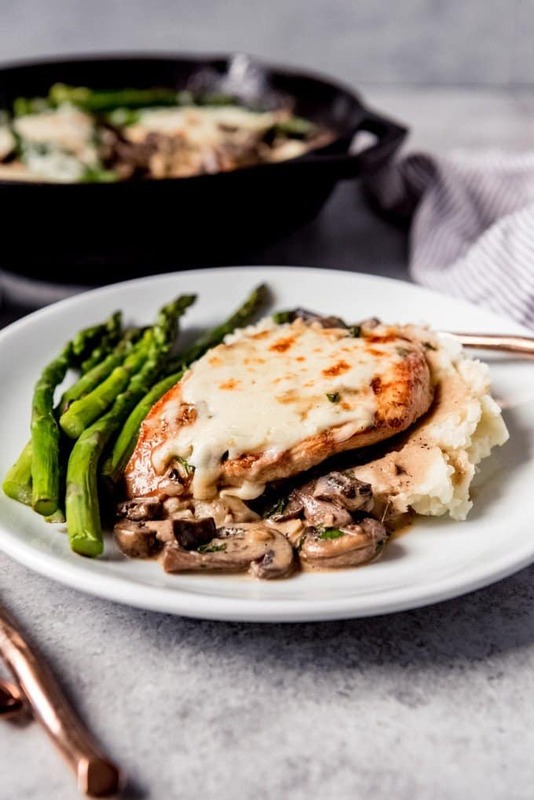 Just like at Cheesecake Factory, we like to serve the Chicken Madeira with creamy mashed potatoes on the side. And for the full eat-at-home restaurant experience, you could make a black forest cheesecake for dessert! 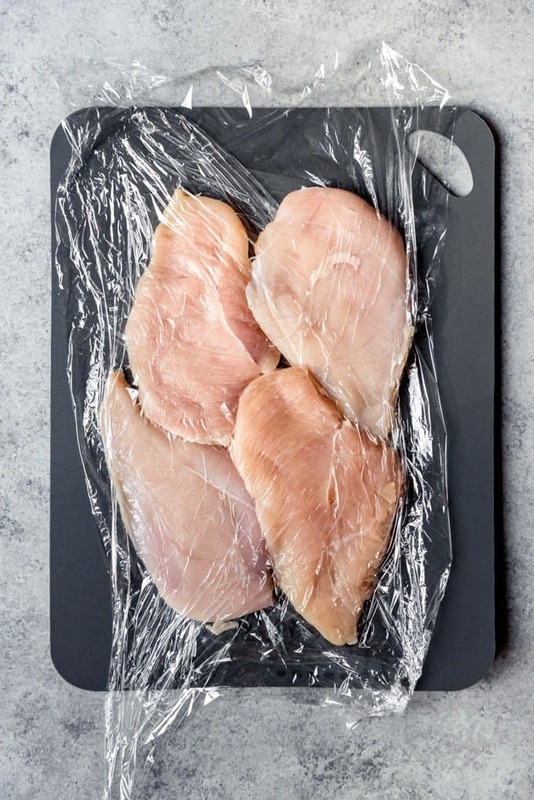 Start out slicing the chicken breasts in half lengthwise and using a meat mallet or rolling pin to pound each piece of chicken to 1/4″ thickness. You want them nice and flat, and fairly thin so that they cook quickly and evenly. I do this between two pieces of plastic wrap to help keep the chicken juices from splattering everywhere. Season the chicken on both sides with salt and pepper. Set aside. Bring a large pot of salted water to a boil. A good rule of thumb is 1 tablespoon of salt to 6 cups of water. In a large skillet, melt a little butter and oil over medium-high heat. Add the sliced mushrooms and season with salt and pepper. Cook for about 5 minutes, stirring occasionally, until softened. Add the garlic for the last minute, then transfer the mushrooms to a plate. 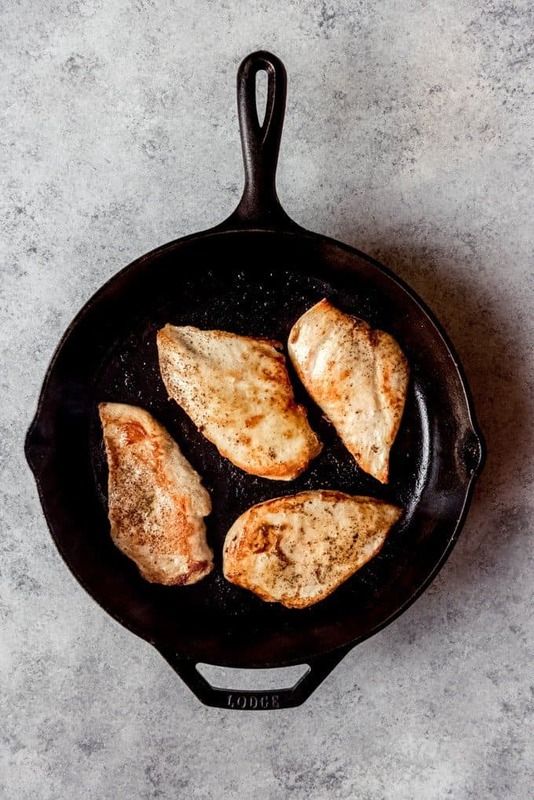 In the same skillet, melt a little additional butter and oil and saute the chicken breasts for 3-4 minutes on each side until nicely browned and cooked through. 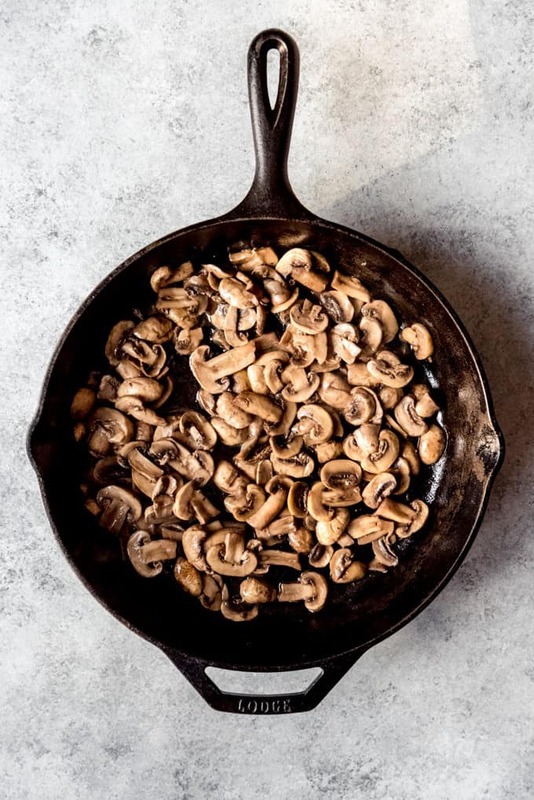 Transfer to the plate with the mushrooms. In the same skillet, add the Madeira wine and bring to a boil. Boil for 5 minutes until reduced by half, using a wooden spoon to scrape up any browned bits from the bottom of the pan left over from cooking the chicken. Once the Madeira has reduced by half, add the beef broth and boil for about 10 minutes until about 1 cup of liquid remains (about 1/4 of the original volume of liquid). Reduce the heat to medium-low and add the cream. Let the sauce simmer for 2 minutes until slightly thickened. Taste and adjust salt and pepper as needed. While the Madiera sauce is reducing, blanch the asparagus by adding it to the pot of boiling water and cooking for 2-3 minutes, just until tender-crisp and bright green. Immediately drain and set aside. Return the chicken and mushrooms to the pan, tossing to coat in the Madeira sauce. 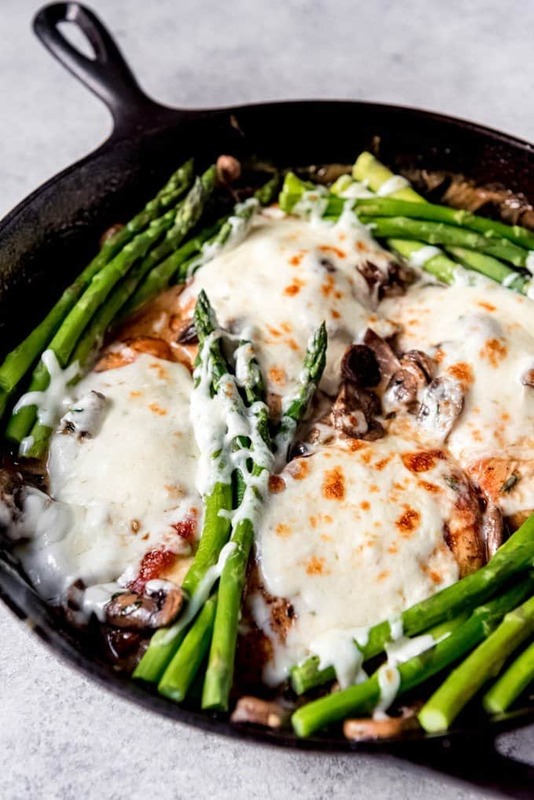 Arrange the blanched asparagus around the chicken and sprinkle with the mozzarella cheese. Place the skillet in the oven under the broiler for 3-4 minutes, just until the cheese is melted, then serve with mashed potatoes. If asparagus isn’t in season or is crazy expensive, you could easily sub in fresh green beans in stead. Our family doesn’t drink alcohol so I had a really hard time finding Madeira wine the first time I went looking for it. Not to be deterred from recreating a restaurant favorite at home, I eventually enlisted of another shopper in the wine section at Whole Foods who walked me right to it in the “dessert wines” section next to the Marsala wine and Sherry. 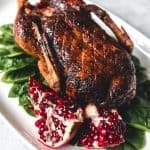 But if you have a hard time finding the Madeira wine to make this recipe, you might need to go to an actual liquor store since apparently many regular grocery stores don’t stock it. It’s absolutely worth it (and necessary for this dish) to hunt down the Madeira wine. 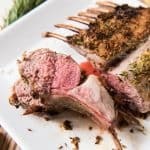 It makes a sauce that is both savory and sweet, with unique, complex flavors that you just can’t get with any other combination of ingredients and we absolutely love it. For anyone else in my boat who has basically zero experience with wine, the bottle I bought cost about $7 and I used about half of it to make this recipe. We actually googled how long wine lasts in the fridge once it has been opened and it sounds like for Madeira wine maybe about 5 days-ish according to this Bon Appetit article. So this would be a great opportunity to have friends over to use the entire bottle by doubling the recipe. 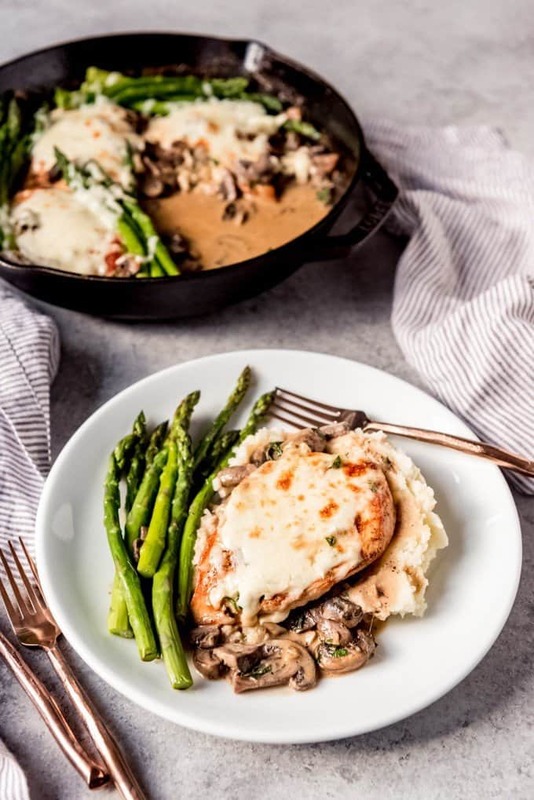 Fresh mushroom Madeira sauce, tender crisp asparagus, and melted cheese pair with tender, juicy sautéed chicken breasts to make this Chicken Madeira recipe that is one of our favorite family dinners that is special enough for weekend cooking or holidays, but easy enough for weeknights when we are craving something different from the norm. It's touted as one of the most popular menu items at the Cheesecake Factory. Once you've tasted a bite it's easy to see why! Slice chicken breasts in half lengthwise. Use a meat mallet to pound each piece of chicken to 1/4" thickness between two pieces of plastic wrap. Season chicken on both sides with 1/2 teaspoon salt and 1/4 teaspoon pepper. Set aside. 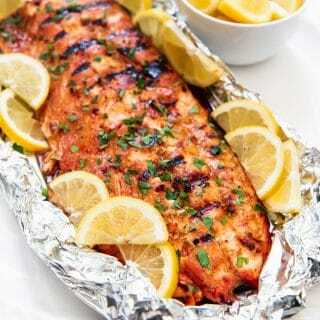 In a large skillet, melt 2 tablespoons of butter and 1 tablespoon of oil over medium-high heat. Add the sliced mushrooms and season with 1/4 teaspoon salt and 1/4 teaspoon pepper. Cook for 5 minutes, stirring occasionally, until softened. Add the garlic for the last minute, then transfer cooked mushrooms to a plate. In the same skillet, melt 1 additional tablespoon each of butter and oil. Saute the chicken breasts for 3-4 minutes on each side until nicely browned and cooked through. Transfer to the plate with the mushrooms. In the same skillet, add the Madeira wine and bring to a boil. Boil vigorously for 5 minutes until reduced by half, using a wooden spoon to scrape up any browned bits left over from cooking the chicken from the bottom of the pan. Once the Madeira has reduced by half, add the beef broth and bring to a boil. Boil for about 10 minutes until only about 1 cup of liquid remains (about 1/4 of the original volume of liquid). Reduce heat to medium-low and stir in the cream. Let the sauce simmer for 2 minutes until slightly thickened. Taste and adjust salt and pepper as needed. While the Madiera sauce is reducing, blanch the asparagus by adding it to a large pot of salted, boiling water and cooking for 2-3 minutes, just until tender-crisp and bright green. Drain immediately and set aside. 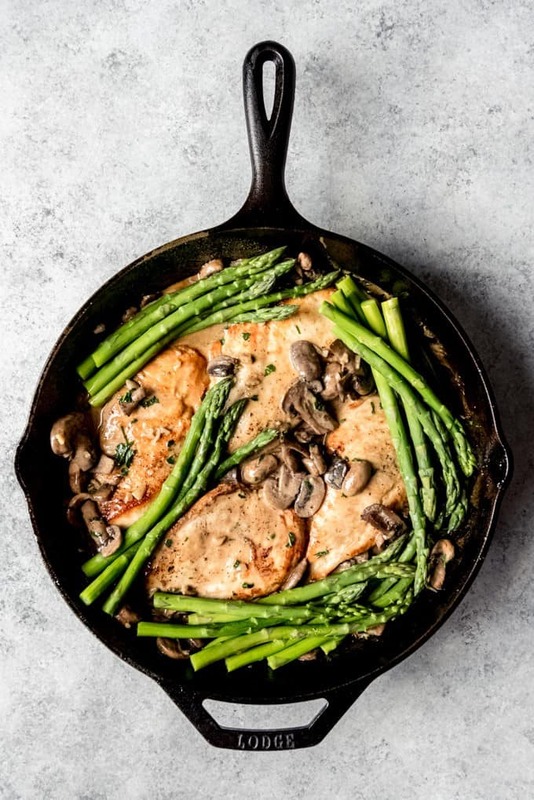 Return the cooked chicken and mushrooms to the pan, tossing to coat in the Madeira sauce. 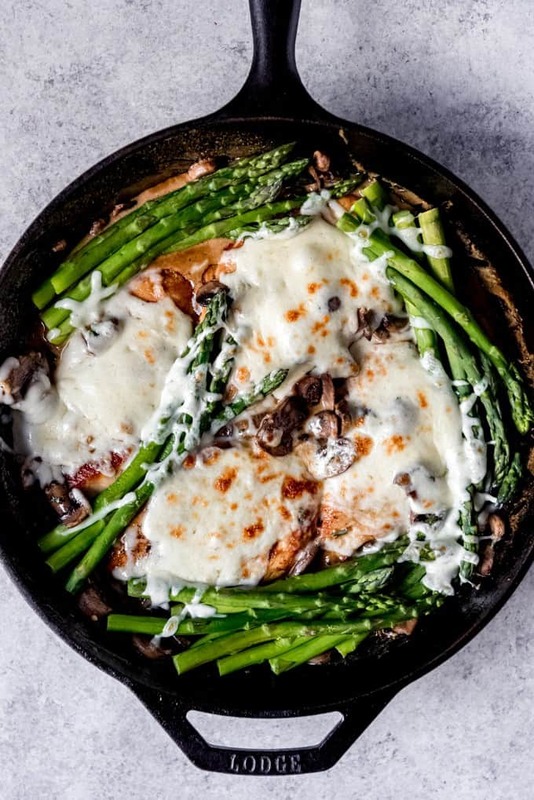 Arrange the blanched asparagus around the chicken and sprinkle with mozzarella cheese. 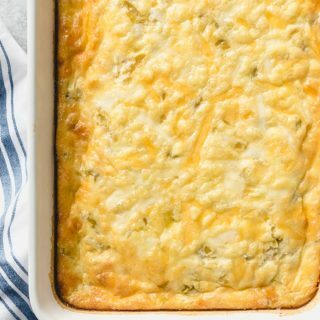 Place the skillet in the oven under the broiler for 3-4 minutes, just until the cheese is melted, then serve with mashed potatoes. Lightly adapted from Natasha's Kitchen. Since today is National Cheese Lover’s Day, I joined forces with some of my food blogging friends to share brand new cheese inspired recipes for you! Be sure to check them out below! This looks like a dish that would be perfect for company. I love the creamy sauce and the crunch of the asparagus. I love copycat recipes made at home…I think they taste better because you can put your spin on them and they’re cheaper to make. This looks amazing. Yum! I love this. It looks absolutely comforting and delicious. I’ll have to get it next time I am at the Cheesecake Factory too! This sounds delicious. 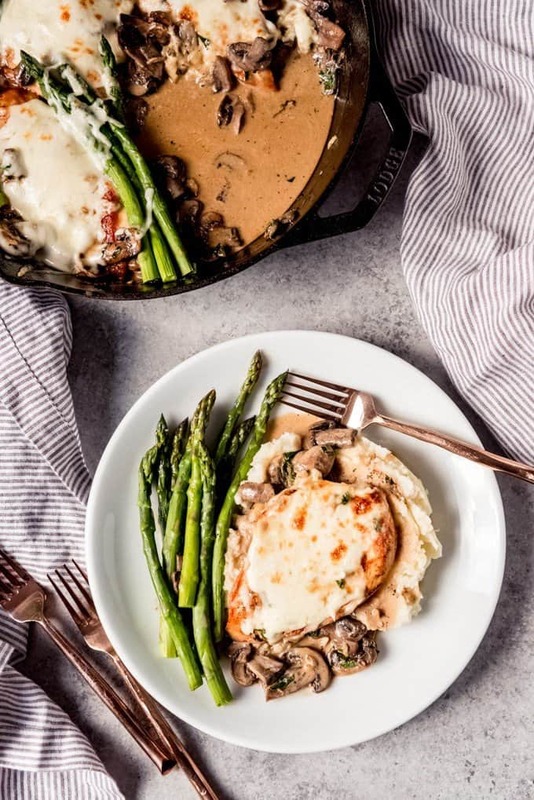 Chicken Marsala is a regular around here but I’ve never tried Chicken Madeira. Thanks for the inspiration and for hosting this fun event. This is the one meal I always order at The Cheesecake Factory….I’m excited to make it at home now!!! I love restaurant copycats because I like to know what’s going into my food. This looks so good! That beautifully melted mozzarella cheese has me swooning. I used to live near a Cheesecake Factory, but they’re all many hours away from us, so a good copycat recipe I can make at home is exactly what I need. This will definitely be going into the rotation! I love the rustic and simple ingredients in this chicken dish. 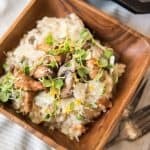 I love mushrooms and cheese with chicken- the splash of wine is the icing on the cake for me! Google does not always give you the whole story. On how long a bottle of wine is drinkable after it has been opened, there are many solutions to extending its life—most of them terribly expensive. Amy, I read this and decided to send you a fix for your problem—- ” We actually googled how long wine lasts in the fridge once it has been opened and it sounds like for Madeira wine maybe about 5 days-ish according to this Bon Appetit article. So this would be a great opportunity to have friends over to use the entire bottle by doubling the recipe.”—–There are many ways to extend the life of a bottle of wine, most of them very expensive and involving shiny equipment.My way is simple. Buy a bag of marbles, the size that will drop into a wine bottle. Replace the wine that you use in a recipe, or drink, until the wine left in the bottle rises up to its original level. The marble trick is to eliminate exposure of the remaining wine to the Oxygen in the air which turns the wine to something else, maybe vinegar. Thank you so much for that helpful idea! I have never heard of that marble trick before but I’m going to have to try it! Made this last night and it was a HUGE hit! Will make again!